There are two reasons to remember the name of Gainesville, Florida: The University of Florida, home of the Gators, and Tom Petty and the Heartbreakers. The former is a first-class advanced education public institution, the second is one of the best-known musical groups connected with southern – or heartland – rock. Reacting to the rise in synthesized music, the Heartbreakers were all about the basics – guitar, bass, drum – and accordion. The band formed in 1976 and made music for decades together, until the untimely death of Petty in 2017. 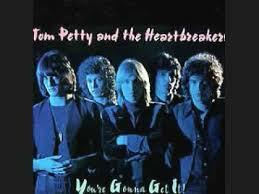 The three albums Petty recorded as a single artist still included members of the Heartbreakers. You’re Gonna Get It! was the band’s second album, released in 1978. More successful commercially than their debut, it was deemed critically inferior. Fortunately, that did not discourage the band, who went on to produce ten more albums together.